Tripe is an organ meat made from the lining of animal stomachs. Although it may come from pigs, lambs, goats, chickens or ducks, tripe is usually made from the first three of the cow’s four stomachs. In many countries, tripe is popular as an economical source of protein and nutrients. It needs to be slow-cooked for a tender result but, even then, the chewy texture is an acquired taste. Like most organ meats, tripe is extremely nutritious and provides benefits to your health. In addition to being a good source of protein, tripe is rich in B vitamins and minerals, including calcium, iron, magnesium, phosphorus, zinc, manganese and selenium. Tripe has less fat than most other meats. A 3-ounce beef steak has 14.5 grams of fat as opposed to 3.4 grams in the same amount of tripe. With its minimal carbohydrate content, tripe makes a good addition to your weight-loss plan. A low-carb diet lowers insulin levels, which causes the body to burn stored fat for energy and ultimately leads to weight loss, says Mayo Clinic. A randomized controlled trial by the Public Health Collaboration compared low-carbohydrate diets to low-fat diets and found that the group on the low-carb diet lost significantly more weight. Tripe is also an excellent source of protein, providing over 20 percent daily value (DV) per 3-ounce serving. This organ meat supplies all the amino acids that your body needs to build muscle and make hormones, enzymes and new tissue. 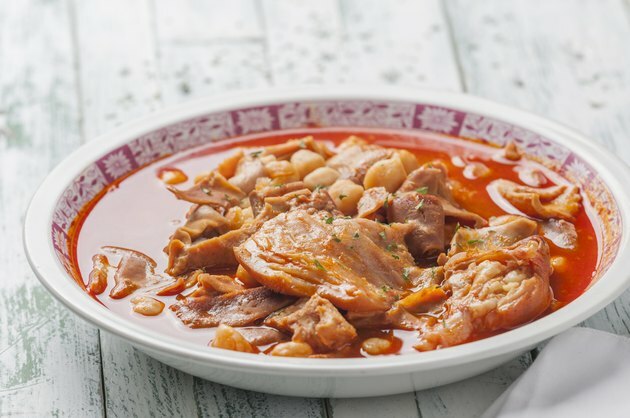 Tripe contains some important B vitamins, including niacin, folate and B12, or cobalamin. Tripe's B12 offering is .6 grams or 9 percent of the DV per 3-ounce serving, according to the USDA National Nutrient Database. Vitamin B12 supports nerve cell function and is needed for red blood cell formation. The B vitamins play a key role in converting homocysteine to methionine, one of the major building blocks that produce new proteins in your body. An accumulation of homocysteine in your bloodstream could put you at risk for cardiovascular disease, as shown in a study published in the American Journal of Preventive Medicine in 2015. A diet rich in vitamin B12 may also prevent B12 deficiency anemia, which may cause numbness or tingling in the hands and feet, a smooth and tender tongue, weight loss and weakness. Read more: Is Beef Heart Healthy? Tripe has a substantial amount of selenium, with 10 micrograms per 3-ounce serving — the equivalent of 15 percent DV. Your cells rely on selenium to control thyroid gland function, enzyme activity and DNA production. Selenium is an antioxidant that protects your body from damage by free radicals that may cause disease, according to the National Institutes of Health. Your cells rely on selenium in addition to zinc for the synthesis of thyroid hormones. And tripe is a good source of zinc to help accomplish this. Zinc is a mineral that's also important for healthy skin, healing of wounds and growth. It's found all over your body — in bones, teeth, hair, skin, liver, muscle and white blood cells, says the Merck Manual. A 3-ounce serving of cooked tripe contains 1.5 milligrams of zinc, which is about 15 percent DV. Another trace mineral in tripe is iron, with .6 milligrams per serving. Iron is needed by your body for the production of hemoglobin, the component of red blood cells that carries oxygen to your body’s tissues. Iron is also a vital component in muscle cells and necessary for the formation of many enzymes in your body. American Journal of Preventive Medicine: Is Vitamin B12 Deficiency a Risk Factor for Cardiovascular Disease in Vegetarians?